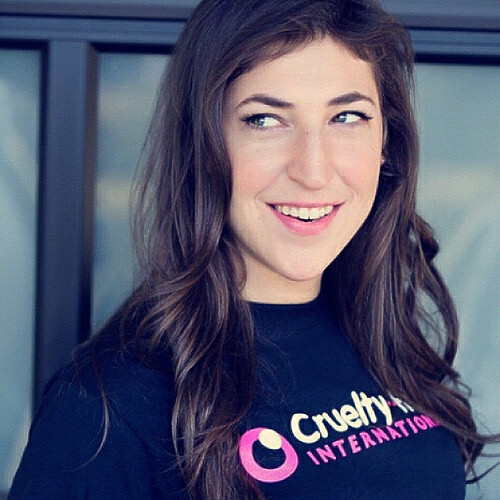 Mayim Bialik often gives a range of diverse parenting advice on her blog that you could either take or leave. Either way, you always end up learning something new. This time, the Big Bang Theory actress is sharing her tips on helping a child through their sickness without the use of medicine. Please note: Bialik makes it clear that she’s a PhD, not an MD. Everything she discusses below is not a medical suggestion to be adopted without discussing with your pediatrician to ensure they are appropriate for your family. A fever is nature’s way of killing a virus. Our last cold had a little fever, and I don’t give Western medication for fevers like that. Skeptical parents will say, “Oh, you must be a mean mama who likes her kids to be uncomfortable.” I respond, “No, not at all. I believe in the body’s ability to heal itself and to cope with challenges. I believe the body gets stronger when it fights off viruses. We’re good.” What do I do? Fever can be managed with less clothing and cool compresses if needed. Usually, rest and cuddly time makes a fever very bearable. A runny nose and sneezing is nature’s way of getting the virus out of the body. I don’t believe in giving medicines that dry up the mucous membranes or make you stop sneezing. To me, that’s interrupting the body’s way of expelling the virus. Skeptical parents will again say that I must be a mean mama who likes her kids to be uncomfortable. Again I would respond that the body knows how to expel a virus. Those symptoms are trying to manage the cause and make the virus go bye-bye. What do I do? I encourage the runniness: warm liquids like decaffeinated teas help. I don’t typically give my boys anything but water ever (except for breakfast smoothies on occasion), but when they are sick, I am happy to give things like processed smoothies or orange juice, since it goes down with more excitement than water and makes for more trips to the potty and therefore, more virus leaving the body. Speaking of runny (sorry, gross, but appropriate), if your child has a loose tummy, know the signs of true dehydration before assuming they need a supplement like Pedialyte. Diarrhea can generally be tolerated by most bodies with simple remedies, and there are ways to hydrate that don’t have to rely on those supplements which some people find objectionable. The body needs to heal when it’s sick and this is best done with downtime. When my kids were little, I never had them watch TV at all, and many parents in my circles believed TV was overstimulating for young children who are sick. Now that my boys are older, I don’t mind them watching some simple cartoons when they are sick to pass the time. I also will work super hard to get a nap into a sick body, especially into a body that has lost the art of napping because it hasn’t napped regularly in, oh, four years. It took me 45 minutes to get Little Man to fall asleep, and he slept for about 45 minutes. He really needed it. I knew he did. It just took a lot of work to get him there. (Starting him nursing again occurred to me around the 30 minute mark but I resisted…). Being sick isn’t fun. This last bout made Little Man miss out on photo club while First Born went out with Dada and we were stuck at Dada’s house (since I don’t have TV, the ex and I decided I would watch Little Man at his house where there is TV). I brought over his favorite food (avocado sushi) and vegan chocolate pudding (his first time trying it; big no-go). I also brought other favorite foods like cantaloupe and blueberries. And I let him pick what we did; we could have read books or watched TV (he chose a Garfield movie) or whatever. Sick baby is in charge in my mind. I hate having sick kids. I also respect that we are organisms on this planet and it’s going to happen. I use a variety of things to make my kids feel better even though I don’t favor Western medicine, and I respect everyone’s right to treat sickness how they do. I believe in Western medicine when appropriate, but in general, I believe in other methods of caring for them.